In this video we demonstrate a protocol to establish mouse thymic lymphoma cell lines. By following this protocol, we have successfully established several T-cell lines from Atm-/- and p53-/- mice with thymic lymphoma. Jinadasa, R., Balmus, G., Gerwitz, L., Roden, J., Weiss, R., Duhamel, G. Derivation of Thymic Lymphoma T-cell Lines from Atm-/- and p53-/- Mice. J. Vis. Exp. (50), e2598, doi:10.3791/2598 (2011). Established cell lines are a critical research tool that can reduce the use of laboratory animals in research. Certain strains of genetically modified mice, such as Atm-/- and p53-/- consistently develop thymic lymphoma early in life 1,2, and thus, can serve as a reliable source for derivation of murine T-cell lines. Here we present a detailed protocol for the development of established murine thymic lymphoma T-cell lines without the need to add interleukins as described in previous protocols 1,3. Tumors were harvested from mice aged three to six months, at the earliest indication of visible tumors based on the observation of hunched posture, labored breathing, poor grooming and wasting in a susceptible strain 1,4. We have successfully established several T-cell lines using this protocol and inbred strains ofAtm-/- [FVB/N-Atmtm1Led/J] 2 and p53-/- [129/S6-Trp53tm1Tyj/J] 5 mice. We further demonstrate that more than 90% of the established T-cell population expresses CD3, CD4 and CD8. Consistent with stably established cell lines, the T-cells generated by using the present protocol have been passaged for over a year. For tumor dissection, a clean paper towel or disposable surgical drape is placed on the dissection pad and sprayed with 70% ethanol. Mice for this protocol are routinely euthanized with CO2.Place the euthanized mouse on the dissection pad and spray both sides of the animal with ethanol. The mouse is held in place onto the dissection pad by using four or more push pins inserted through the legs and sprayed thoroughly with 70% ethanol. The skin over the midline is cut from the pubis to the base of the head by using sterile scissors, while avoiding the underlying muscles and penetrating into the body cavities. Open the abdominal cavity with a new pair of sterile scissors and forceps being careful to not damage the internal organs. Open the thoracic cavity by dissecting and deflecting the rib cage to reveal the tumor, without damaging blood vessels. Separate the tumor from other organs, and transfer a piece approximately 40-50% of the total tumor (approximately up to 1.5 X 0.8 X 0.8 cm) into cold PBS kept on ice. The remaining portion of the tumor can be saved for other assays and a complete necropsy can be performed at this time. Spray the tube containing the dissected tumor with 70% ethanol and transfer to a biosafety cabinet. Add 10 mL of culture medium to a sterile 150 mm2 Petri dish. Transfer the piece of tumor into the Petri dish by gentle suction with a pipette. Bend two sterile 18 gauge needle facing the beveled side out. Dissociate the tumor using the bent needles. Swirl the dish, tap gently and place at an angle to collect the cell suspension to a side, while avoiding large pieces of tumor. Aspirate the cell suspension and transfer into a 50 mL conical tube while avoiding large pieces of tumor. Wash the plate with 10 mL of medium and transfer into the same tube while avoiding large pieces of tumor. Mix the cell suspension composed of lymphocytes and stromal cells gently and transfer 5 mL into a T-25 tissue culture flask and 10 mL into a T-75 tissue culture flask. Gently swirl the flasks. Use the remaining cell suspension to make 2, 4, 10,100 and 1000 fold dilutions in 2.5 mL final volume (culturing cells at different densities using several types of culture vessels maximizes the likelihood of establishing a T-cell line). Plate 2.0 mL of each dilution into individual wells of a 6-well plate. Gently swirl the plate. Incubate the cells for 48 h in humidified CO2 atmosphere in air. After 48 h of incubation, add 5 mL of medium to the T-25 flask and 10 mL of medium to the T-75 flask along the wall with minimal disturbance of the cells. Add 2 mL of medium to each well of the 6-well plate along the wall with minimal disturbance of the cells. Incubate the cells for an additional 72 h.
At the end of the fifth day of incubation, the cells are passaged at a 1:1 ratio, while retaining the original flasks and plates (maintaining the cell density at a concentration of approximately 3x106/ mL during the first passages promotes successful establishment of a continuous cell line). For the T-25 flask, transfer 5 mL of cell suspension into a new flask containing 5 mL of medium. Add 5 mL of medium into the original flask. For the T-75 flask, transfer 10 mL of cell suspension into a new flask containing 10 mL of medium. Add 10 mL of medium into the original flask. For the 6-well plate, transfer 2 mL of cell suspension from each well into corresponding wells of a new plate containing 2 mL of medium in each well. Add 2 mL of medium into each well of the original wells. Incubate all flasks and plates for an additional 72 h. In our experience most cell lines are established from these passage one cultures (the presence of loosely adherent suspension cell aggregates over the attached stromal cells is an early indication of an established cell line). For the cultures with fewer or no loosely adherent suspension cell aggregates, feed the flasks or plates by carefully replacing approximately 50% of the medium every 72 h. To avoid removing cells from the original culture, culture vessels are left standing and undisturbed for at least 5 min to let the cells sediment at the bottom by gravity before gentle aspiration of the supernatant medium. Established cell lines are passaged into new flasks and plates. For T-25 and T-75 flasks, add 5 mL of the original or passage one suspension into 5 mL of medium. For 6-well plates, add 3 mL of the original or passage one cell suspension into 7 mL of medium in a T-25 flask. Feed and retain the original or passage one culture by replacing the volume removed with fresh culture medium. Passage established cell lines into new T-25 flasks. The cell lines have a doubling time of 18-24 h. The cultures are routinely maintained at a density of 1-3x106/ mL and passaged every 3 days. Add the required volume of previous passage culture to new medium to make up to 10 mL. Feed and retain the original culture. After a few passages, the non-adherent cells will self sustain without the adherent stromal cells and a smaller number of adherent cells are carried over with each passage. Beyond this point, the cultures can be maintained in non-tissue culture treated T-25 flasks. The cell lines are frozen in freshly prepared RPMI 1640 medium containing 20% FBS and 10% DMSO. Cells from a 48 h old culture in T-25 flask (approximately 1.5x106 cells/ mL) are centrifuged at 1500 rpm for 5 min at room temperature. After discarding the supernatant, the cells are re-suspended in 2 mL of cold freezing medium. Two 1.0 mL volumes of cell suspension from each flask are placed in freezing vials, immediately frozen at -80°C, and transferred to liquid nitrogen the following day. Cells are recovered from liquid nitrogen storage by quick thawing, and resuspending the contents in 10 mL of fresh culture medium. Alternatively, freshly thawed cells are washed once in warm culture medium to remove the DMSO before resuspending in 10 mL of fresh culture medium. The cells are cultured for at least 72 h before subsequent passage. 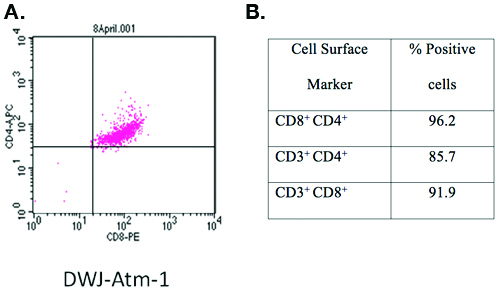 An Atm-/- T-cell line developed using this protocol and designated DWJ-Atm-1 was characterized by staining with anti-CD3-FITC, anti-CD4-APC and anti-CD8-PE and flow cytometry analysis (Figure1). More than 90% of the T-cells were CD3, CD4 and CD8 triple-positive. Figure 1. Characterization of a T-cell line developed using this protocol. The cell surface markers of an established Atm-/- cell line designated DWJ-Atm-1 were characterized by staining with anti-CD3-FITC, anti-CD4-APC, anti-CD8-PE and flow cytometry analysis. Briefly, 1X106 fresh cells were washed once in cold PBS (1500 rpm/5 min), and incubated at 4°C for 10 min with 200 μL of antibody cocktail (each antibody at 1:200 dilution in PBS with 1% BSA. Cells can be examined immediately while fresh or fixed for later analysis. Fixed cells are prepared by adding neutral buffered formalin at a 4% (vol/vol) final concentration and incubated at 4°C for 30 min, harvested by centrifugation (1500 rpm/5 min) and resuspended in 200 μL of PBS with 1% BSA. A total of 1 X 104 cells were analyzed by using a BD FACS Calibur analyzer and CellQuest software (BD Biosciences, San Jose, CA). In this protocol, we provide detailed procedures to establish murine T-cell lines from two different mouse genotypes; Atm-/- [FVB/N-Atmtm1Led/J] and p53-/- [129/S6-Trp53tm1Tyj/J]. By using this protocol, a total of 6 (out of 7 attempts) Atm-/- and three (out of 5 attempts) p53-/- murine T-cell lines have been established in our laboratory. Representative data demonstrating that cell line DWJ-Atm-1, anAtm-/- cell line consists of a cell population in which greater than 90% of the cells express CD3, CD4 and CD8 surface markers confirm that clonal T-cell line can be established using our protocol. Development of murine T-cell lines has been reported 3,6,7; however, detailed protocols for establishing these lines have not been described previously. Although only two mouse genotypes were used for derivation of murine T-cell lines in our laboratory, we believe that these procedures are applicable to a wide range of spontaneous T-cell lymphomas found in other strains of mice such as Kras defective,and potentially other animal species. Murine T-cell lines have potential applications in understanding basic questions in immunology and oncology. Currently, we are using these cell lines in studies aimed at characterizing host-pathogen interactions and genotoxin-induced cytotoxicity including mechanisms of cell cycle arrest and apoptosis. Given that murine T-cell lines share genomic alterations such as deletions of PTEN and FBXW7 in common with acute human T-cell lymphoblastic leukemias and lymphomas, they are particularly well suited for research in cancer biology 8, and may have further applications for rapid pre-clinical efficacy screening of immunological and cancer chemotherapeutic agents in vitro. Whether or not these cell lines can be propagated in vivo in either syngeneic or immunocompromised mice has not been determined. In contrast to previous protocols in which successful establishment of a T-cell line took up to three months 6, cell lines developed using the current protocol were established within a month (between passage 2-8). We found that the presence of loosely adherent cell aggregates over attached stromal cells is a critical early indication of an established cell line. In order to allow murine T-cells to propagate indefinitely, we also found that it is important to leave the initial loosely adherent cell aggregates undisturbed during feedings. In addition, maintaining the cell density at a concentration of approximately 3x106/ mL during the first passages also promotes successful establishment of a continuous cell line. In our experience, culturing cells at different densities using several types of culture vessels maximizes the likelihood of establishing a T-cell line. Most T-cell lines were established from T-75 flasks or 6-well plates and 10 or 100 fold dilutions which correspond to approximately 1x107 or 1x106 cells/ mL. A previous protocol recommended culturing cells at 5 x 106, 1 x107,and 2 x 107 cells per well in 6-well plates, and feeding after 7 days (7). We observed that feeding initial cultures at 48 h and passage 72 h later, on day 5 is optimal. Waiting longer before the first feeding and passage will cause the cells to lose their viability and stop dividing. The last parameter which we found is critical to successful propagation of murine T-cells in vitro is the presence of FBS in the culture medium that can support rapid cell growth. Different lots and suppliers of FBS should be screened prior to initiating the derivation of T-cell lines for identification of an appropriate reagent. If murine T-cell lines are not available for screening, primary cultures of thymic lymphocytes placed in wells of a 24-well plate at a concentration of 1x106 per mL of test medium containing concanavalin A (1μg/ mL) to stimulate rapid cell growth is adequate. In the presence of an optimal source of FBS, the number of cells should double every 18 to 24 h.
The authors wish to thank Dr. Boris Reizis from the Department of Microbiology and Immunology at Columbia University for helpful discussions. We also wish to thank Dr. Margaret Bynoe, Dr. Rodman Getchell and Deequa Mahamed from the Department of Microbiology and Immunology at the College of Veterinary Medicine, Cornell University for technical assistance with flow cytometry and Lu Huang for assistance with video editing. The authors also wish to thank the members of Duhamel and Weiss laboratories for their critical review of the manuscript and video production, and Stephanie Yazinski from the Weiss laboratory for breeding and genotyping p53-/- mice. Experiments on animals were performed in accordance with the guidelines and regulations set forth by Cornell University Institutional Animal Care and Use Committee. This research was supported in part by funds provided by the US Department of Agriculture, Cooperative State Research, Education, and Extension Service, Animal Health and Disease Research Program (to G.E.D. and R.S.W.) and NIH grants R03 HD058220 and R01CA108773 (to R.S.W). The video was produced using in-house facilities by the personnel from the Duhamel & Weiss laboratories. Barlow, C. Atm-deficient mice: a paradigm of ataxia telangiectasia. Cell. 86, 159-171 (1996). Elson, A. Pleiotropic defects in ataxia-telangiectasia protein-deficient mice. Proc Natl Acad Sci U S A. 93, 13084-13089 (1996). Kuang, X. Control of Atm-/- thymic lymphoma cell proliferation in vitro and in vivo by dexamethasone. Cancer Chemother Pharmacol. 55, 203-212 (2005). Browne, S. E. Treatment with a catalytic antioxidant corrects the neurobehavioral defect in ataxia-telangiectasia mice. Free Radic Biol Med. 36, 938-942 (2004). Jacks, T. Tumor spectrum analysis in p53-mutant mice. Curr Biol. 4, 1-7 (1994). Chervinsky, D. S., Lam, D. H., Zhao, X. F., Melman, M. P., Aplan, P. D. Development and characterization of T cell leukemia cell lines established from SCL/LMO1 double transgenic mice. Leukemia. 15, 141-147 (2001). Sharma, V. M. Notch1 contributes to mouse T-cell leukemia by directly inducing the expression of c-myc. Mol Cell Biol. 26, 8022-8031 (2006). Maser, R. S. Chromosomally unstable mouse tumours have genomic alterations similar to diverse human cancers. Nature. 447, 966-971 (2007).